Over 600 regional business leaders, legislators, and key decision makers participated at the PNWER Annual Summit July 22 - 26 in Spokane at the Davenport Grand Hotel. 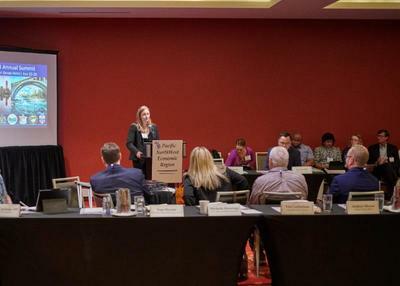 Delegates explored shared challenges in the region, discussed best practices, promoted regional relationships, and developed an action plan for addressing these challenges in the coming year. Select the session to view proceedings, presentations, and action items. Congresswoman Cathy McMorris Rodgers in discussion with Colin Robertson, Canadian Global Affairs Institute during a study tour hosted by BNSF Railway. Evan Reis, Executive Director and Co-founder of the U.S. Resiliency Council spoke about the steps that communities and leaders can take to strengthen their resilience in the wake of natural disasters. ﻿Video available. Fmr. U.S. Amb. David Wilkins, Chris Sands, Center for Canadian Studies; Colin Robertson, Canadian Global Affairs Institute; and Dan Ujzco, Dickinson Wright spoke on the current state of free trade. Video available. 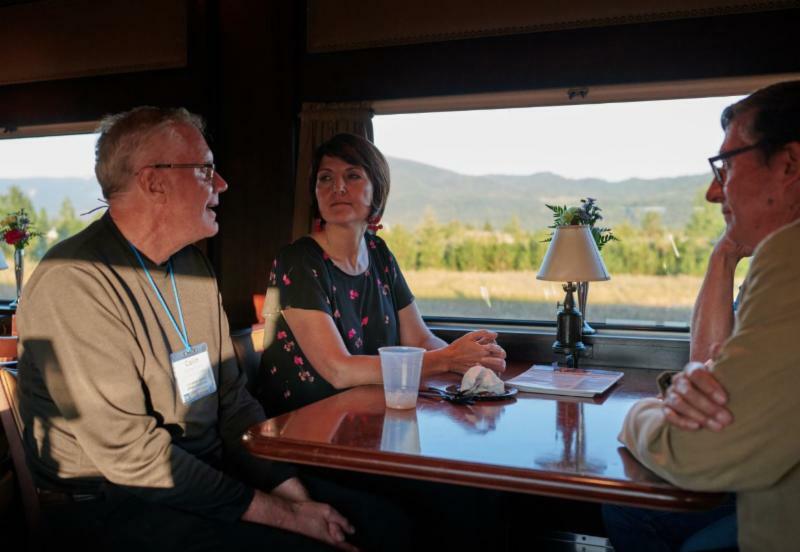 Jill Smail , US Chief Negotiator for the Columbia River Treaty and Sylvain Fabi, Canadian Chief Negotiator for the Columbia River Treaty heard from local stakeholders on the importance of the treaty to the region and the two nations. Video available. Hon. 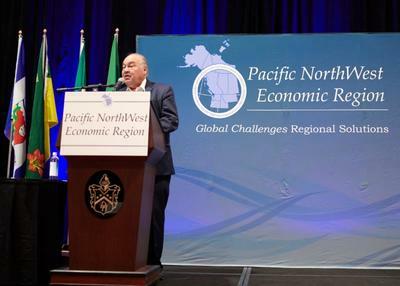 Bob McLeod, Premier of the Northwest Territories was elected as PNWER's newest Vice President. The two day Columbia River Tour took participants to BC to visit sites and hear from local stakeholders. 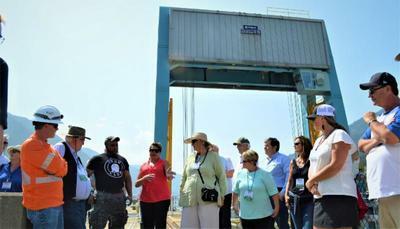 Here participants visit the Keenleyside Dam in Robson, BC. 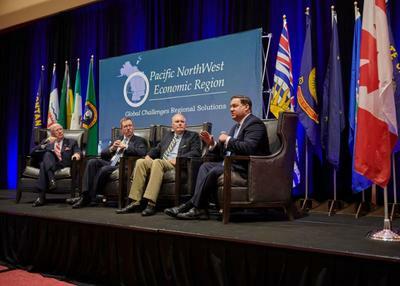 620 regional and national leaders came to Spokane to strengthen the U.S. Canadian relationship. Todd Mielke, Greater Spokane Inc.
Irene Plenefisch of Microsoft accepts the Alan Bluechel Award on behalf of Brad Smith at the PNWER Summit. Min. Conroy and Mr. Conroy are recognized for their efforts of bi-national Columbia River Treaty cooperation. The Honourable Katrine Conroy, Minister of Children and Family Development and Minister responsible for Columbia River Treaty, British Columbia and Former MLA Ed Conroy were recognized by Senator Arnie Roblan of Oregon (right to left) with the the Hot Potato Award for their years of work regarding Columbia River Treaty issues. 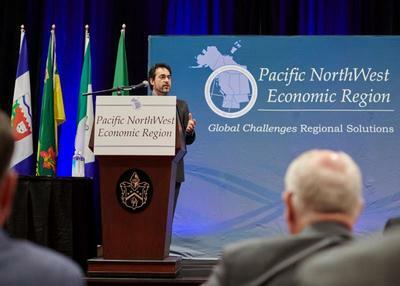 It is the policy of the Pacific NorthWest Economic Region (PNWER) that all participants, including attendees, staff, volunteers, and all other stakeholders at PNWER meetings will conduct themselves in a professional manner that is welcoming to all participants and free from any form of discrimination, harassment, or retaliation. 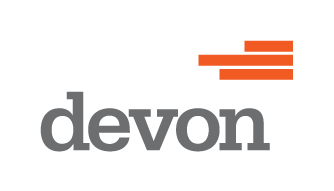 To make it possible for true collaboration, creativity, innovation, and idea exchange to thrive we are committed to facilitating a welcoming, respectful, and professional community for all. Participants will avoid any inappropriate actions or statements based on individual characteristics such as age, race, ethnicity, sexual orientation, gender identity, gender expression, marital status, nationality, political affiliation, ability status, educational background, or any other characteristic protected by law. Disruptive or harassing behavior of any kind will not be tolerated. Harassment includes but is not limited to inappropriate or intimidating behavior and language, unwelcome jokes or comments, and unwanted touching or attention. Inappropriate behavior will not be tolerated. PNWER reserves the right to refuse entry to or remove any party from the event at any time. Sanctions may range from verbal warning, to ejection from the meeting without refund, to notifying appropriate authorities. If you witness or are subjected to inappropriate behavior or have any other concerns, notify a PNWER staff member as soon as possible.